Free discussion and debate are some of the distinguishing features of a lively society. However, all debates are not necessarily positive. Sometimes, issues devoid of any meaning or significance become the subject matter of debates. A debate that began in July 2015 can be put in the latter category. K.K.S. Narayanacharya of Karnataka, in his book Vaimiki Yaru (Who was Valmiki? ), wrote that Valmiki was a Brahmin. This was, by no means, a new discovery. But it “hurt” the sentiments of those who believe they are descended from Valmiki. The issue became politicized in no time. 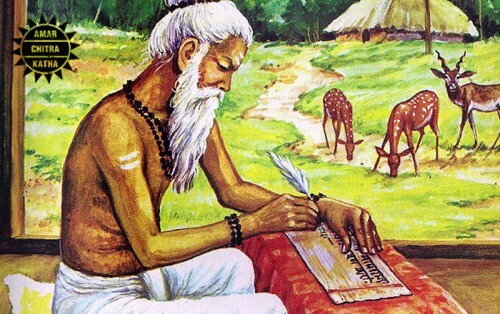 It was claimed that Valmiki was born into the family of “Veda” and that declaring him a Brahmin was an attempt at brahmanization of Dalit heroes and a ruse to usurp the author of the Ramayana. The controversy soon reached the judiciary and the Karnataka High Court constituted a 14-member committee to ascertain Valmiki’s caste. The problem is that the gentleman concerned lived 2000-2500 years ago and never wrote a thing about himself. There is no information on his personal life that can be proved to be correct. On top of it, numerous legends related to him are in circulation, many of which contradict each other. In his books, Valmiki describes himself at one place as “Chandaal” and at another as “Pracheta-Putra” (son of Pracheta, a rishi). How can anyone find out the caste of such a person with any degree of certainty, that too 25 centuries after he is dead and gone? What makes the issue even more complicated is the arsenal of arguments available to our religious scholars. “He was a Brahmin by deeds … by birth everyone is a Shudra” or “After he wrote the Ramayana, all his sins were washed away and so he got the status of a Brahmin, just as Matang Rishi, who was born to a Brahmin mother and a Shudra barber father and was a Chandaal according to contemporary norms”. And for argument’s sake, even if a scholar of unimpeachable credentials were able to prove conclusively that Valmiki was a Dalit, how on earth would it benefit today’s Dalits? They conveniently ignore the fact that at no stage in history only the Kshatriyas ruled and only the Brahmins provided intellectual leadership to society. In every age and in every region, there were people who rose above the Varnashram system and did things that they were not traditionally supposed to do. But since historiography was dominated by a particular class, the contribution of such pioneers remained unrecognized. The chroniclers wrote only what suited their class interests. Therefore, no matter which caste Valmiki was born into, in the absence of historical evidence, he will always remain a Brahmin for them. The community that wants to hang on to the Varna system and yearns to build its cultural identity, will not rest. It will protest with all its might. ‘No, he was one of us”, they say. Their ideal is the culture that accords them the highest position in social hierarchy just on the basis of their birth, with their deeds of no consequence at all. They discarded a scholar and a Brahmin like Ravana and branded him as a demon because he had become a stumbling block in the expansion of their culture. The Ramayana is the ideal scripture of this class and hence, for them, its author can never be a non-Brahmin. About 150 years ago, the ideological ancestors of those who have today stirred a hornet’s nest by their Valmiki-was-a-Brahmin assertion had tried to delude the people by claiming that anyone and everyone could reach the summit. “At one time, the dacoit Ratnakar reached the summit, didn’t he?” But then, those were different times. Sick of the prevailing social inequality, the oppressed sections were out to desert them. The Mehtars of Punjab were worshippers of “Balashah”. Inamuddin, the Pir of Balashah, in his book Deed-Haq, had declared that Balashah was an incarnation of Valmiki. “He wanted to get a foothold among the ‘Chuhars’ to Islamicize them.” (Omprakash Valmiki, Safai Devta, page 72). As Inamuddin’s influence spread, a “Valmiki Thaan” began appearing in every village. Both puja and namaaz were held at these thaans. This upset the occupants of the top storeys of the caste edifice. If those in the lower storeys continued to migrate, who would clean their excreta? Who would address them as “annadata”, “huzur”, “maalik” and “Kripanidhan”? By then, the Arya Samajis had also joined the action. They said, “Don’t fall into the trap of others. You are one of us. Remain so.” “But where is the place for us in your religion?” asked some educated youngsters. Pat came the answer: “Haven’t we given conferred the title of ‘Aadikavi’ [the original poet] on Valmiki?” This was aapaddharma (religion of crisis) for them. They accepted Valmiki just as they had accepted Vishwamitra consuming meat during a famine. The Indian community has perfected the art of weaving stories that suits its interests. Legends about Valmiki were also created to serve the vested interests of the social class concerned – whether it be the myth of the dacoit Ratnakar or of Valmiki getting covered by a colony of ants while performing penance, or of the talisman given to him – to continuously recite “Mara, Mara”. Probably, the elite feared that the name of Ram would be polluted if it was uttered by a Dalit. The construction of Valmiki temples and recitation of the Ramayana began in 1901. Bhai Parmanand wrote in his book Valmiki Muni Ka Jeevancharitra (Life of Valmiki Muni, 1925) that “Aadi Valmiki and the Chandaal Valmiki were different people”. A couple of years later (1928-32), Arya Samaji Ameenchand Sharma wrote Valmiki Prakash. The book told the members of the Chuhar class that “Valmiki was not their ancestor but their guru”. The community, reeling under grinding poverty, illiteracy and apathy for thousands of years, could not understand this cunning. They just wanted a corner for themselves in Indian history and culture. Arguments over whether Valmiki was a Brahmin or a Shudra can go on and on. They are unlikely to reach a logical conclusion. If some people want to engage in this controversy, let them also begin a campaign for the “purification” of the Ramayana. Their ancestor’s original work Paulatsyavadh contained only five chapters. The two chapters describing Ram as an incarnation of Vishnu were added much later to convert it into the Ramayana. Those who believe that Valmiki was their ancestor should also resolve to restore his original work. They should clean up the muck that is being bandied around as their ancestor’s work. Can any community or caste grow without a cultural base? Answering this vexed question is absolutely essential for the building of a parallel culture. This may be difficult but it is not impossible. Just begin an objective and free exploration. Break down what is written in the Vedas and the Upanishads. Let the fragments be tested against the parameters of the Bahujan culture. Maybe, initially, you would get nothing from the resulting debris. But this process will give birth to new and lively heroes. The real journey of identity building will begin from there.